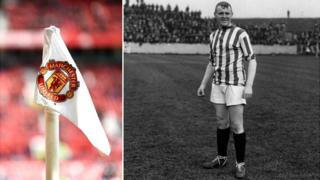 A footballer labelled Manchester United's "first real star" has been inducted into the National Football Museum's Hall of Fame. But Charlie Roberts is now remembered more for his trade union activism off the pitch than his success on it. Roberts was an England international who captained the Red Devils to their first two league titles and their first FA Cup win in the years before World War One. He was also a campaigner for players' rights, founding football's first successful players' union and leading his team of self-declared "outcasts" to victory over the Football Association (FA). Born in County Durham in 1883, he had grown up among mining communities that were at the heart of the burgeoning trade union movement - an upbringing that would go on to influence his later career. His football talent took him to Manchester United in 1904 where his robust defending made him a fans' favourite. He was capped for England a year later and, over the next few years, captained the Red Devils to their first major trophies. The team was hit by one of football's forgotten tragedies, though, in April 1907. Scottish defender Tommy Blackstock, 25, collapsed and died on the pitch after heading a ball during United's match against St Helens. His death spurred Roberts and his teammate Billy Meredith - one of the game's early superstars - into action. Roberts' grandson Ted Roberts said: "There was nothing available for Blackstock's family, and my grandfather was horrified that nothing was available. "So they decided to do something about it." Roberts and other star players were already unhappy about the FA's wage cap, which prevented clubs from paying players more than £4 a week - the equivalent of about £440 today. He believed "footballers were working men like any others, and deserved to be treated fairly", said football historian Dr Gary James. The pair founded the Association of Football Players' and Trainers' Union (AFPTU), popularly known as the Players' Union, with the aim of removing the the wage cap and winning footballers the same rights enjoyed by other workers. This worried the FA and club owners. "Football was a business, just as it is now, and... clubs had to make money to pay their staff," said Dr James. "The authorities didn't want the possibility of fixtures disappearing due to strikes." Despite clubs' reservations, many footballers joined the AFPTU, and the FA reluctantly recognised it as the players' official representative body. This uneasy peace deal failed in spectacular fashion in 1909. A proposed transfer to Chesterfield saw Fulham's George Parsonage, who was not keen on making the move north, ask for more than the regulation signing-on fee of £10. Aghast at what they saw as an exorbitant request, the Derbyshire club reported Parsonage to the FA, who banned the midfielder for life. In response, the AFPTU gathered a petition of 1,322 signatures. Fearing strike action, the FA demanded players resign from the union or face a life ban. While most left, Roberts' United teammates stood firm - and were promptly suspended by the club. A stand off between the club and players ensued. Roberts and his colleagues posed with a wooden sign calling themselves "The Outcasts Football Club". This photograph made the front pages of the next day's newspapers "much to our enjoyment and the disgust of several of our enemies", as Roberts later recalled. As the beginning of the 1909/10 season neared, the row had still not been resolved. Unable to put out a side, United contacted their first opponents, Bradford City, to discuss the possibility of a cancellation. However, the FA backed down and struck a deal which allowed union members to play in Football League matches. Revenge was taken on Roberts, however. Although he went on to become one of the country's most expensive footballers when he moved to Oldham Athletic for £1,500 in 1913, he was frozen out by the FA. He never added to his three England caps won in 1905. The union survived and would later become the Professional Footballers' Association - which finally won its battle to abolish football's wage cap in 1961. Gordon Taylor, its long-serving chief executive, said modern multi-millionaire players should be aware of the role Roberts played. "I think it's really important. They need to know the state of the profession they are in and the part that Charlie Roberts played," he said. "By coming together and showing solidarity, Roberts and his teammates helped make the game attractive. They had big concerns. The profession of football was not even recognised at the time. "Now we can be very proud that this country has got the most full-time professional clubs in the world."